CAPE ELIZABETH - Victoria Simes Poole died on Dec. 9, 2018, at her home in Cape Elizabeth. She left this world with the same dignity, grace and wit that she lived her almost 91 years. She was born on Dec. 26, 1927 to Charles F. Simes and Dorothy Wright Simes. She grew up in Cape Elizabeth and moved to Portland's Western Prom prior to the start of WWII. Victoria attended Waynflete School, The Masters School at Dobb's Ferry, N.Y. and Connecticut College, graduating with a degree in English, It was during her schooling that Victoria became a voracious reader, and a student of all things literary and historical. As a life-long learner, she used every opportunity to expand her knowledge. She was a serious supporter of education, serving as a trustee for Waynflete School and Kent School in Kent, Conn. She served as a member of the board and a docent at the Victoria Mansion in Portland, and she was one of the founding members of the Cape Elizabeth Land Trust. In 1950, she married Parker Poole, Jr. and between 1951 and 1964, she and Parker had six children and lived for many years on Bowdoin Street, in Portland, and then moved to Cape Elizabeth. In 1976, Parker and Victoria's fifth child, Talcott, (aka Sam) developed a heart condition that required a heart transplant which was performed in 1977 at Stanford Medical Center. He was the third youngest heart transplant recipient. This experience provided Victoria with the opportunity to share with others the trials and tribulations of dealing with a life threatening illness. The family learned how precious life is and how to survive and persevere throughout its highs and lows. She wrote Thursday's Child which was published in 1980 and it is still used today as a resource for families going through similar experiences, as well an assigned text in several high school curriculums. Though Victoria loved being in her home, and especially enjoyed times with her expanding family and friends, she was also an excellent traveling companion of Parker's. Their travels took them on regular visits to the Caribbean and to almost every European capital, a goal of Parker's. She developed an interest in health and fitness because of her children's athletic pursuits. In the late 70s and early 80s, she took up running and ran in several road races. 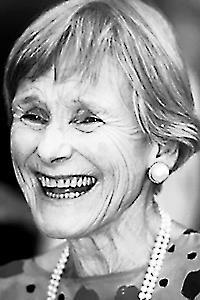 She continued as an avid walker and was a competitor in the Beach to Beacon for many years. She was honored by Joan Benoit Samuelson who presented her with a lifetime race bib number, 1927, the year she was born. Victoria was a great steward of all things. She took care of family, friends and home in a multitude of ways. She was a sounding board and adviser to three generations of family, and their many friends who sought her counsel on a variety of topics, from one's love life, to fashion trends, to gardening, to literature and genealogy. Finally, Victoria was a consummate storyteller and writer. She could make history come alive. She was honored in her twenties by T.S Eliot who gave her a signed copy of his complete poems and plays when she won a writing competition. Her memory, until the end, was sharp as a tack and she could recite poetry learned from grade school on. She was well known for her intelligent and witty poems. These poems are treasured by anyone who was lucky enough to be a recipient. Victoria was predeceased by her husband, Parker, in 2008; her son, Talcott (Sam) in 1982; her sisters, Rosamond Richardson and Louise Simes, and an infant brother, John. She is survived by her five children and their spouses. Malcolm and his wife, Patti of Scarborough, Parker III and his wife, Diane of South Portland, Charlie and his wife, Liz of Yarmouth, Tina Thomas and her husband, Henry of Baltimore, Md., Alix Sawyer and her husband, Mark of Cape Elizabeth; and her niece, Louise Davis of Bozeman, Mont. She was adored by her 15 grandchildren and her nine great-grandchildren. She will be missed by all who knew her. The family would like to extend their deep appreciation to all the nurses from Northern Light Health for their expertise, kindness and compassion during the last six months. Advanced directives and clear communication helped us to make sure that our mother had a "good death." In her final days, one of her last comments was, "I never thought this experience would be so pleasant." A memorial service will be held at 10:30 a.m., on May 11, at St. Luke's Cathedral, State Street, Portland. Arrangements are under the direction of Jones, Rich & Barnes Funeral Home, Portland. Please visit www.jonesrichbarnes for further information and to sign Victoria's guestbook.